Family and friends of Travis Gibson and his family are raising money to pay for medical expenses associated with a double lung transplant. 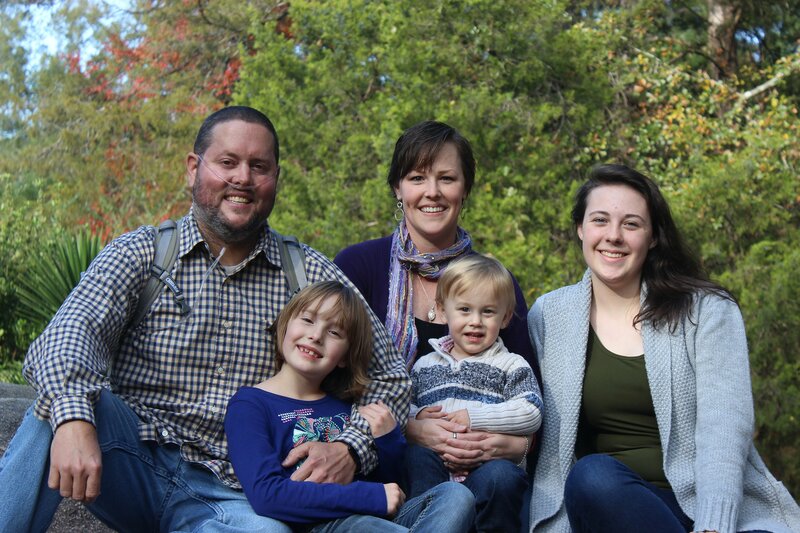 The family lives in Georgia and will be having the transplant in Charleston, SC. It is a requirement to live within 10 minutes of the hospital for 3 months post transplant. Travis has chosen to fundraise with Help Hope Live because of tax deductibility for corporate donors. Donors can be sure that funds donated will be used only to pay or reimburse medically-related expenses. To make a tax-deductible donation to this fundraising campaign, click on the Donate Now button. Travis has had the transplant, and there have been many trials and problems along the way. He is stable and making progress, slowly but surely. I apologize for not keeping this updated there have been so many things going on from moment to moment that it was all I could do to keep 1 update location. So to see the journey and read my updates please visit the public Facebook page, Transplant for Travis. Thank you for your love, prayers and support. After arriving at MUSC, the doctors decided the lungs were not good enough to do the surgery. After waiting on traffic to clear a little and eating dinner in the hospital cafeteria, Travis was told there was a chance a different pair of lungs could come to him. They wouldn’t know anything until after midnight Tuesday night. Em and Travis went to stay at Em’s grandparents’ house in North Charleston and headed home today. Someone else received those lungs last night. please pray for them and both donor families. Please continue to pray for the perfect lungs for Travis! We have officially been listed for 4 weeks today! It has been the slowest and most anxious month of our lives, with each of us tied to the phone, and wondering if the call will come. But we are grateful for the extra time as a family. The month has been full. Travis has decided the “Pay it Forward” and raise money and participate in various local charity walks. He has put 2 different teams together, one for the Miracle Mile Walk and one for the Walk to End Alzheimer’s #walk2endalz. As long as he is able, he will continue to do this, so join a team or let us know if you have an event and we will participate! We had the monthly check-up last Friday, and all was the same. The doctor did inform us that they had a couple offers (matches) for Travis, but one set of lungs was too small and the other was not in good shape. So as strange as that sounds, it is a little reassuring, that there are at least matches for him, given the blood type, size and his antibodies. He has had a little cold, and while on the active transplant list we have to let the doctors know as soon as he has even a sniffle. They swab his nose and test for 16 different viruses, 8 of which will require inactivation on the list, at least temporarily. If they were to transplant him with one of these viruses it could cause rejection immediately, and death. No playing around! So, he currently has rhinovirus, the common cold, but the past couple days his symptoms are worsening. We are hoping it is nothing new, but waiting on the doctors to decide the proper action. Most likely they will be having us see the pulmonologist here to swab his nose and check everything out. His breathing has definitely been worse the last 2-3 days. We will keep you all posted, and please pray that the deactivation lasts only a short time if it happens. On another note, it looks like we will be having some insurance changes coming in January, and we are waiting to see how this will affect the surgery. Our doctor feels that Travis should be transplanted prior to this, so we are hoping! But the medicine coverage will definitely affect us, and our cost will be significant for all the medications he will be on post-transplant. We appreciate continued prayers for this area too! Thank you all for your continuous love, prayers, support and encouragement. Once again, we would not be able to get through this struggle without your support! Thank you and God bless you. You are each in our prayers! If you want to order a #TransplantforTravis t-shirt or other item see this link! Not much has changed, pulmonary function tests were the same with a lower rate of diffusion, they will continue to monitor this. The prednisone will be dropped again in a month…and that will probably take it’s toll. Joint pain has already increased as well as fatigue. They need me to be going to rehab at least 4 days a week. Anyone want to drive? We were blessed with a wonderful day of golf at the Dealers Cup Charity Golf Tournament this past Sunday. Thank you everyone for your support! Visit the Facebook page to see photos! Losing weight has to be one of the hardest I have ever tried to do. My caloric intake has been dropped from 2500 calories to 1800 calories so I’m hungry all day. As for my exercise, I will be going to pulmonary rehab five days a week as well as walking my 1.5 miles at night. On to the frustrating part, keeping track of what I eat as well as weight training/cardio does not seem to be helping with weight loss. It has been suggested that I not do weights so often and just focus on more cardio. Weight training is going to keep me from looking like Urkel after 8 weeks of not using my arms. Besides, how much cardio can one human being do in a day? I can’t believe my story has been shared over 1000 times on Facebook. As of 08/29/2017, we are so close to meeting our monetary goals. Thank you for your generosity and continued support. I wanted to give a small update for things coming up in the next couple weeks. The first half of September is going to be really busy. To kick things off, family reunion at the lake. It will be good to get away from real life for a bit and enjoy great company. Next up on the list is my wife’s birthday. Recommendations for something to do for this amazing woman? I could not have made it through the last 9 months without her by my side. Golf tournament time! Don’t forget it is on the 10th of September starting at 9:00am. Bring your skills or yourself to hang out. Of course, our next appointment would fall on the same day as my anniversary. Hard to believe Emily has dealt with my craziness for seven years and stuck around. I cannot say enough how patient and kind she is. Emily has the heart of an angel and I am blessed to call her mine. Here is a local newspaper article about Travis and the Transplant. Once again, we are waiting! Travis saw the doctors on Friday. The plan is nothing set in stone per se, just more waiting, which by now we are very good at! The selection committee meets Wednesday to decide, but they may hold off for another few weeks, and see how he does. They have asked that he continue to lose weight, which has been frustrating. He is pushing as hard as he can on the lesser dose of prednisone and building his strength and muscle mass. The weight seems to have stayed the same, which makes him feel as if he is not making progress. The reason for this was explained, studies show the excess fat cells can cause serious problems with primary graft dysfunction. The long and short of it is that it can lead to more immediate rejection in the event of a transplant. So, they really want him as “healthy” as he can be for the best possible outcome. He will drop the prednisone dose again in 2 weeks, bringing him down to 10mg a day. This will most likely cause his breathing to get worse, with increased shortness of breath. This in turn causes him to feel worse and have a harder time working out and exercising. But he must be down below 10mg in order to have the surgery. The doctor explained that right now the average wait time for MUSC patients is 9 days, meaning when you are listed within 9 days (possibly) to 2 months you can have a transplant. He wants to hold out another month or so if Travis’ health can allow it. He explained it like this: if the average post-transplant life expectancy is 5 years, by waiting now he is giving him 5 years and one more day, week, month etc. Each day we wait the more his life expectancy is, as long as the rest of his body remains healthy. If at any time he gets worse, things change or his breathing capacity decreases they will consider listing him sooner. It is very particular to each patient in how this transpires, and that makes it difficult too. There is no “one size fits all” remedy for this lung disease and even potential transplant. We have complete confidence in the transplant team at MUSC and they definitely have Travis’ best interest. We were under the impression that this past visit would lead to him being listed which meant a start on the fundraising efforts. We are so very grateful for all of you who donated, shared, prayed and showed support for us. The burden of the financial aspect has been lifted so when they list him we are ready. We cannot express enough how much that has blessed us! Thank you all and we will keep you posted on any news. Please keep Travis, Emily, and the kids in your prayers as they head back to Charleston today for more tests tomorrow. The support from everyone has been astounding. Emily and Travis are very grateful. This journey for Travis is going to be long and continued prayer is appreciated. If you have not signed up for the golf tournament September 10th benefiting Travis, you can do so by contacting Pete Story at 803.643.3051. Please visit the FaceBook page ‘Transplant for Travis’ for details. It is amazing to see all of your support! Here is a quick video for you. Please take a moment to watch a video Travis’ kids put together. Travis and Emily, Your Ipswitch Community is thinking of you and your family during this difficult time. Your courage and spirit is an inspiration to all of us.